As the Cyprus Property Action Group discovered much of the blame for the Title Deed scandal rests with conveyancing lawyers whose duplicity earned them their designation as one of the largest criminal classes in Cyprus. IT IS MY unhappy duty to point out that, in all of the discussions and bally-hoo about the Title Deeds problems in Cyprus, there is one glaring omission for which I can only blame the press, the presumed guardians of the people’s rights. I should explain that more than 10 years ago my wife and I were in at the beginning of Denis O’Hare’s Cyprus Property Action Group (CPAG) whose investigations did so much to expose the rottenness of the real estate business in this country. Much of the blame for the present state of affairs has rightly fallen on crooked developers and their accomplices in the banks. But in this vast field scarcely a word can be heard of the nefarious dealings of the fourth participant, the virtually invisible conveyancing lawyer whose perfidy has earned them as a group their designation as one of the largest, if not the very largest, criminal classes in Cyprus. Case after case investigated by the Cyprus Property Action Group revealed that the real culprit in the transaction was the buyer’s lawyer, whom the typical British buyer had characteristically trusted to look after his or her interests, including title searches to ensure that the property was free of encumbrances. Without the lawyer’s witting or unwitting collusion, a large part or most of these mortgage problems would have been avoided as, had the buyer become aware of these obstacles, he or she would simply not have bought the property. CPAG also found that many lawyers had secretly represented both sides in the transaction or had even “gone over” to the other side later on. The simple fact is that the prudent foreign would-be buyer almost invariably hires a lawyer to represent his or her interests and is only too frequently deceived and cheated by this fourth element in the transaction. It is further pointed out that this is no secret. Everyone knows that “legal ethics” in Cyprus is a rather bad joke. But why has the problem so rarely been included or even mentioned in the course of all the publicity that has been given to the subject? In the whole vast area of property matters hardly a single whisper of legal chicanery can be heard. One can only conclude that the legal profession, which provides the majority of MPs, is one whose faults and sins simply cannot ever be discussed or even raised. For this to be possible, one can only blame the newspapers that are clearly reluctant to report on these issues and fear even to talk about them. Please prove me wrong by printing this letter. CPAG report ‘Cyprus Property Pitfalls – a time for Action!‘ commissioned by the Cyprus Finance Minister in late 2007, delivered in January 2008 – and ignored by the Catastophias AKEL government. We finally got our deeds after ten years mainly due to own efforts, and help from Nigel. The attempted extortion and cheating by developer and land registry went on till the very end. And the expected IPT refund “may take two years”…..
CPAG kindly helped put a case to the ECHR. However, in spite of being admitted to the court, (which had a front-line defence of Cypriot lawyers manning the office) and remaining there for nearly two years, the court completely ignored two important updates sent recorded delivery with ample pre-paid reply coupons, and a further complaint to the head of the ECHR. Finally we were informed that some Spanish judge “sitting in single formation” concluded that there was no case, that there was no right to appeal, and that the papers would be destroyed. So it’s not not only in Cyprus that unhelpful lawyers thrive but also in such bastions of probity as the ECHR! We would like to thank Nigel and Denis for all their help and advise over the years. Our hound is near the bottom right of your picture- we’d love to feed him a few of culprits!! Legal and ethics are total contradictions here in Cyprus. Effectively, using a conveyancing lawyer here is akin to playing russian roulette and I would certainly have more chance with the loaded pistol. You’re completely correct John, the solicitor I used was totally crooked. When we paid the final instalment on our property he didn’t pass it onto the developer for years. Thank goodness I had a receipt from him confirming I had paid. Unfortunately for me I’m still having to use him for the sale of our property because there is a POA in place and it’s impossible to get another one set up. You are spot on but this has been known and allowed by the government they are all making money out of scamming the buyers. We know that in the UK to represent the buyer and seller is unethical and against the law, I later found out after some snagging problems with my property my solicitor represented the seller/ developer as well. Of course I lost my complaints and lots of money as well. I was also advised by the solicitor that the practice of buying without deeds was normal in Cyprus and would take up to 3 years to get them, I accepted this as I was also advised if I wanted to sell the buyer would also accept the deed issue, 10 years later I have just received them but only after paying 6000euros to get them. This all on a 93000 cy pound purchase price. Buy in Cyprus my advice DON’T unless you like to give away money. My lawyer was very shrewd in dealing with my purchase. She looked after the client and her father looked after the developer. Both lawyers share the same office and have the same name. They are registered as separate companies. xxxxxx & xxxxxxx. The builder fled the island but not before altering bank drafts in favour of his personal name instead of the company. He admitted the offence LIVE on a UK documentary shown last year on TV. Nothing has been followed up by the UK or by Cyprus about these crooked lawyer/developer scammers. We are unable to find a Cypriot lawyer to take this case on. What does that say. You’re absolutely right John. Our lawyer, who skipped the country, (apparently having stolen around Â£3.6 million of clients money…including ours!) was found 7 years later in New Zealand, was returned to Cyprus, taken to court and received just a 15 month sentence (of which he served only 8 months!!) Clearly crooked lawyers have very little to fear from the legal system if their crooked operations come to light! All sounds very familiar, especially the article from u-boat. At that time I believed the law here was the same as UK. This was 2006. I ENDED UP obtaining the permission from the Council of Ministers myself for us to buy the property. Loads of waffle and no action. I wouldn’t touch this lawyer with a bargepole. Brilliant article. Agree with every word. These lawyers are definitely the largest criminal class connected with the Real Estate and Construction Industry. It is appalling that so many of them, educated at some of UK’s finest universities, return to Cyprus and resort to practising law in such a shoddy, corrupt fashion. We too were allowed to buy 2 properties. The land on one was mortgaged and still is. 9 years later we still do not have CFAs on the house on the mortgaged land. At no time did the lawyer advise us that living in a house without a CFA is a crime. Our entire estate received a letter from the local council informing us of this fact some 2 and a half years after purchase. There had been an incident with a tenant somewhere on the estate and we were reminded that we could be evicted without a CFA. We have lived with this threat for years and to compound this we are now paying tax on our crime. I was under the impression that it is illegal to benefit from criminal actions. We have found a brilliant lawyer with a brilliant, ethical law practice. Just a pity it was not 10 years ago. You are correct John Knowles the press does not address the problem of corrupt and duplicitous lawyers. What I really want to know is what recourse do we have against these despicable parasites? There is always this ‘six year rule’ (probably originally put in place by a lobby group of lawyers) – but where mass deception has occurred on such a scale – including documents being handed over to unsuspecting clients as part of the buying process – attempting to indemnify them against come back. Immoral doesn’t even begin to cover it. Via the E.U – UK citizens should be now able to retrospectively enforce proper standards – and if your lawyer did meet them – then you should get your investment back. Either that – or the banks should not be able to garner assets via E.E.Os. Cyprus cannot flout the law when convenient – and then cry foul when it feels abused. And whilst we are on the subject of questionable ‘professionals’ – it’s about time our U.K government stepped in. ‘Hague the vague’ et al have been about as much use to British citizens caught up in this ghastly mess as a chocolate teapot. I have had a very good and honest lawyer, not all lawyers are bad. I used Areti when I bought my apartment and when I have just sold it, she sticks to the letter of the law. I know this to be correct regarding the lawyers ….. Some years ago now I like many others had a issue with our developer, He supposedly transferred the building allowance from another piece of land he owned to our site so he could build 3 houses that where not on our contracts of sale or plans for the site etc (It was to be a green area). After a few meetings letters etc I went to my solicitor who had (maybe still has ) an office in Paralimni near the crossroads. To ask him to represent me his client and start proceedings against the developer for breach of contract. After a few minuets of discussion and an explanation of what I wanted him to do. He cleared his throat and said blatantly “you put me in a very awkward position I have a problem”. I had suspected for a while this was the case, after he said that I said do you mean you act for the developer as well as me? He gave me no answer but did give me a wry smile and a slight nod of the head. he then said I am busy and must see my next client. I just got up and walked out and have never spoken to the man since. Sorry its a long winded story but its true…. I can still see the horrified look on his face when I wanted him to take the developer to court, and a look of panic that said … oh no I have been rumbled. Bent as nine bob notes the lot of them…..
We also have lost every thing…. so why are these thieves not in prison where we would be if we had carried out the same ruthless crimes?????? Maybe too little too late for those who have lost properties due to a combination of lawyers/developers/banks practices, but going forward and IF the trapped buyers bill is made law (then the MPs will have also covered their posteriors, but to a lesser extent that of the banks) and assign the unpaid debts to where they are due…ie developer to bank and developer to state…..thus leaving out the buyer from this equation and rightly so…..I await to see what law is passed in September….. I heartily agree, our Lawyer in 2004 let us purchase two properties and registered both with the L.R. 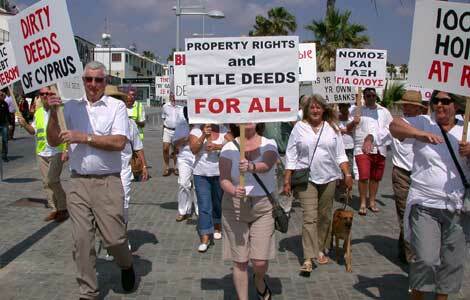 when I believe the law in Cyprus only allowed a foreigner to purchase one property or a limited amount of Land. We were not informed about this or cautioned. The Agent also sold us two properties from different developers without mentioning the restriction also. If we had been informed correctly we would not have lost both and could have bought one outright. absolutely true if our lawyer had done the search and told us about the mortgage we would never have brought this property.